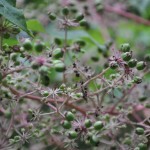 The Perennis chapter is a small, but growing, chapter of the Missouri Native Plant Society based in Southeast Missouri. Plant enthusiasts of this region are lucky to have several botanically interesting and unique public lands not too far from home. Contact us for more information!